In his fast and famous Fox body Mustang, Shawn Pevlor has been a force in Ultra Street and Nitrous X competition across the country. He has won races and set records in both categories, and he has earned the Nitrous X championship three times. While he sold that Mustang, he purchased another Fox body Mustang that’s being made race-ready by Tin Soldiers and will see Ultra Street and Nitrous X action, but in the meantime, fans will find him in the driver’s seat of the SN95 Mustang owned by Tony Bischoff of BES Racing Engines and formerly driven by Nick Bacalis. 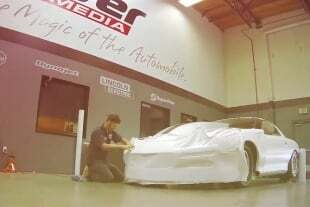 “Tony (Bischoff) and I are friends, and he has built engines for my previous Mustang, and when he asked me at the end of last year if I wanted to drive his car this year, I was very happy to,” said Pevlor. 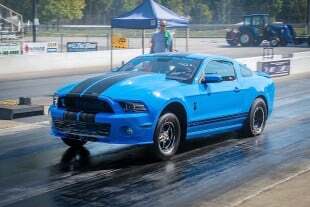 With no seat time in the car, not even when loading it into the trailer, Pevlor headed to the 17th Annual NMCA Muscle Car Mayhem in early March at Bradenton Motorsports Park in Florida, where he entered Mickey Thompson Street Outlaw. “We made two test passes there to make sure everything was good, and then we went into qualifying,” said Pevlor. He then pounded out a 4.47 to qualify in the third spot in the car wearing fresh paint by Chris Alexander of Plated and powered by a 700 cubic-inch Cadillac engine with Ross pistons and cast heads and intake built by BES Racing Engines and enhanced by nitrous. 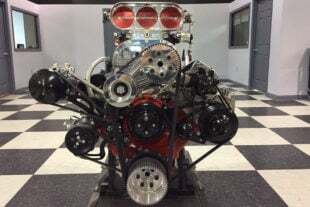 It sips fuel from VP Racing Fuels, and an RPM Transmissions-built Turbo 400 helps plant power in the car rolling on Menscer Motorsports-massaged shocks and struts and Mickey Thompson drag radials. “We were pretty busy after qualifying because something broke on the nitrous system and also a header tube spit an oxygen sensor out and we had to make those fixes before the first round of eliminations,” said Pevlor, who, in addition to Bischoff, is supported at the races by Jason Waterman, Preston Mosher and John O’Neil, as well as Kevin Neal, who offers input on nitrous. With the beast buttoned up in time to belt in for eliminations, Pevlor pushed to a 4.49, 4.55 and 4.62 to win the first three rounds of eliminations, and he made it all the way to the final round, where he faced 2018 NMCA Radial Wars champion James Lawrence. After the close race, Pevlor earned the runner-up finish with a 4.48. “I got very lucky, and now, we’re focused on finding more power, going faster and winning,” said Pevlor. 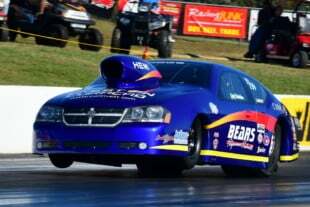 The Ohio-based driver who’s preparing for the 11th Annual Scoggin Dickey Parts Center NMRA/NMCA All-Star Nationals presented by MAHLE, April 4-7 at Atlanta Dragway, is currently in second place in NMCA Mickey Thompson Street Outlaw points. If you can’t be at the race, catch it on this SpeedVideo live stream via presenting sponsor Howards Cams along with FAST, Classic Instruments, Lithium Pros, Thermo-Tec, Race Star Wheels, ProCharger, Flying A Motorsports, Moroso, LME and MAHLE Motorsports.